We believe that the best products we love and use today perfectly balance form and function. Striking that perfect balance is what we try to achieve with ours. The interface is the heart and soul of all of our products and what we have developed is sure to give you the best experience in any marine networking product. Immediately after firing up any of our products for the first time, you will notice how responsive the interface is. We rely on modern technologies to deliver a polished interface and simplify the experience for our users. Unique mechanisms have been developed to enhance the way you use and interact with our products. The bread and butter of what makes any marine networking product great are the device's automatic capabilities. We give you granular control over all automatic behaviors so that your experience is finely tuned to your needs, unlike any other comparable products in the industry. Our philosophy is to continue to innovating, whenever and wherever possible. Not only will we develop new products in the future, but we are constantly adding features to our existing ones as well. Because of this, we have developed an internet-based firmware update system across all of our products. No longer do you have to deal with locating and downloading correct firmware files that utilize confusing flashing utilities. When an update is available for your device, an unobtrusive notification is displayed within the interface. Simply click update, wait a few minutes, and you will have the latest and greatest from Aigean Networks. The best part is, all of your settings, including favorite/saved networks are carried over during the update process! 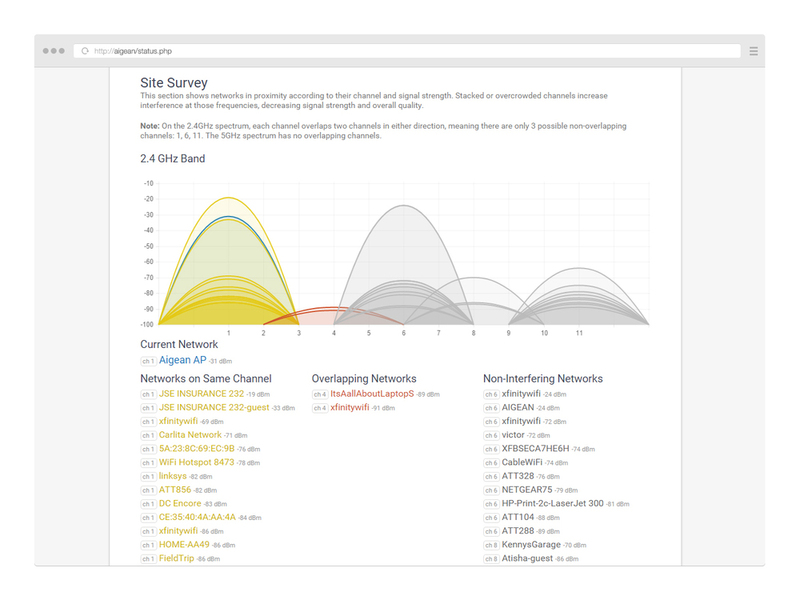 When setting up one of our devices for the first time, you will be presented with the option to allow diagnostic data to be sent to Aigean Networks. We recommend that all of our users take advantage of this opportunity to help us better understand how our products are being used and identify any potential issues they may have. A lot of times we develop a feature or functionality that is not essential to the function of the unit you are using, but we still think they enhance the product. Currently, you can find control for these extras on the settings page. In addition to what is available now, we have some really cool things planned in future updates.